Five days after the execution of overseas Filipino worker (OFW) Carlito Lana in Saudi, Filipino migrants from all over the world marched to Mendiola calling for the ouster of Pres. Benigno Aquino III. Migrante chapters in the Philippines and from 16 different countries gathered in Manila today to commemmorate International Migrants’ Day by demanding accountability from the Aquino government for the worsening conditions of Filipino migrants and their families. The march was participated in by delegates from Migrante chapters in Hong Kong, Macau, Japan, South Korea, Taiwan, Saudi Arabia, UAE, Qatar, Italy, Austria, United Kingdom, Netherlands, United States, Canada and Australia. Delegates from Migrante chapters in Davao, General Santos, Socsargen, Calabarzon, Tacloban, Nueva Ecija, Bataan, Pampanga, Pangasinan and the National Capital Region were also present. “Today, we call for an end to forced migration and modern-day slavery. Today, we stand with OFWs all over the world in the continuing protest against a corrupt, anti-people and anti-migrant government that has treated OFWs as milking cows. Today, we stand with Filipinos all over the world in condemning Aquino’s corruption and subservience to foreign dictates,” said Garry Martinez, Migrante International chairperson. 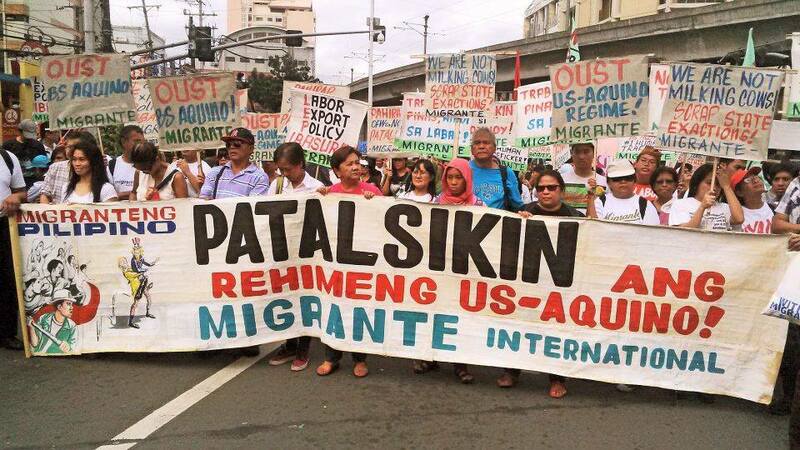 The marchers presented a chain- and whip-brandishing Aquino effigy depicting how Filipino migrants have become “modern-day slaves” because of the regime’s more aggressive and unapologetic labor export policy. Martinez said that under the Aquino administration, OFWs have experienced unforgivable government neglect, the biggest budget cut for OFW services, more exorbitant state exactions and fee impositions, anti-migrant policies that have placed their welfare at stake and an ever-worsening domestic crisis that has aggravated forced migration. Meanwhile, Aquino and his cohorts’ involvement in the pork barrel scam and the Disbursement Acceleration Program (DAP) is yet another “unforgivable” for Filipino migrants and their families. This entry was posted in News and tagged Aquino administration, Aquino government, Benigno Aquino III, Filipino migrants, overseas Filipino worker. Bookmark the permalink.